Ireland continues to be “a profoundly unequal place” and must make greater effort to live up to its commitments on ending poverty and world hunger by adopting the UN sustainable development goals (SDGs) by 2030. 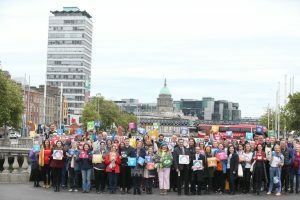 This was the call to action delivered to a large crowd that gathered on O’Connell Bridge to mark the third anniversary of the adaptation of the SDGs on the 25th September. 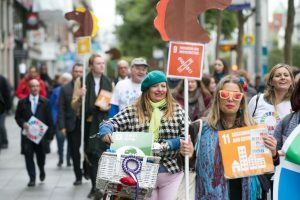 Coalition 2030, is an alliance of over 100 Irish civil society, environmental organisations and networks, including ATD Ireland that led a street march through the city centre as part of a global day of action on Tuesday, the third anniversary. There was a large crowd in attendance including; members of the public, Government representatives, and ambassadors from Germany, Belgium, Mexico, Finland, Norway, Malta and Spain. 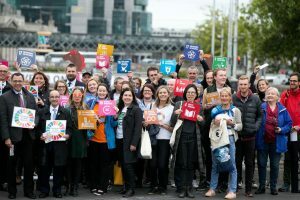 Street actions on O’Connell Bridge invited members of the public to take a picture with their favourite goal and fill out a short survey about the SDGs and public awareness. 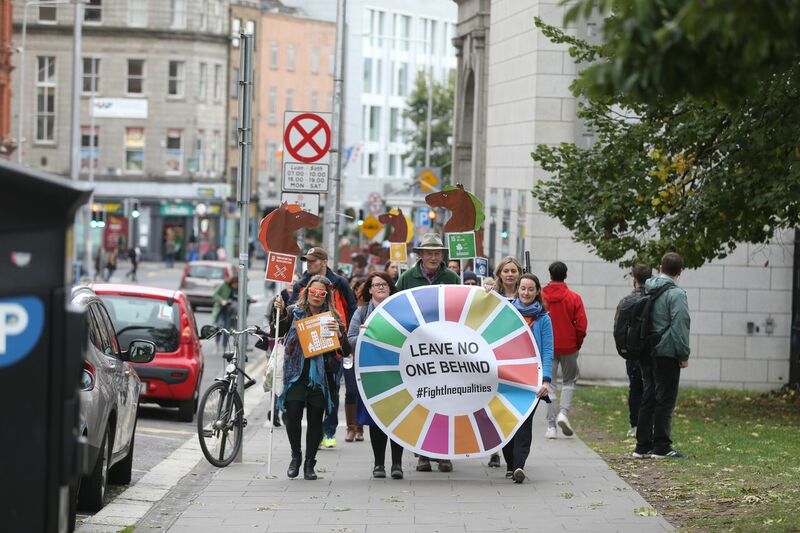 A huge Sustainable Development Goals banner decorated the Rosie Hackett Bridge and highlighted the Leave No One Behind promise of the SDGs agenda 2030. The “Leave No One Behind” promise aims to ensure the 17 goals can only be considered met if they are achieved by all nations, peoples and segments of society, and that the poorest, most deprived and marginalised are reached first. The crowd then made the symbolic march to the Garden of Remembrance where a number of key figures from within the Coalition emphasised the message of the day. Spirited contributions were made by Niamh Garvy (Trocaire), Elaine Nevin (Eco Unesco), Paul Uzell (All Together in Dignity) and David Joyce (ICTU). Mr. Debauw, the Belgium Ambassador to Ireland shared a message from by Her Majesty Queen Mathilde of the Belgians. Valerie Duffy, National Youth Council of Ireland (NYCI) read a message of support for the event by President Michael D. Higgins in which he congratulated the Coalition on their continued work and emphasised the important steps that are needed to ensure each goal is achieved. 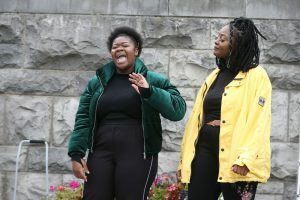 The crowd was then gifted with some spoken word performed by two talented young woman who have been living in direct provision in Ireland for over 5 years. Dr Sean Healy, CEO of Social Justice Ireland, said that with 800,000 people in poverty, 700,000 on healthcare waiting lists and 10,000 people homeless “Ireland is a profoundly unequal place”. Dr Healy said that to see real progress towards the SDGs robust policy coherence is needed to ensure Ireland’s actions in all areas of government do not exacerbate inequality and exclusion. “Policymakers must acknowledge that a thriving economy is not a goal in itself, but a means to social development and well being for all. A concerted all-of-government and all-of-society approach is essential to achieve the SDGs and reduce inequality,” he added. 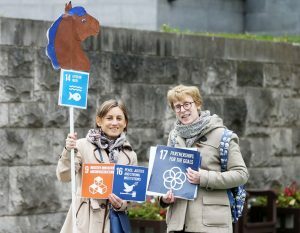 Environmental Pillar coordinator Michael Ewing said ensuring meaningful participation across Irish society was crucial to combating exclusion and achieving the SDGs “for all people, everywhere”. In New York, Tánaiste Simon Coveney joined the annual global Central Park concert to mark the anniversary.